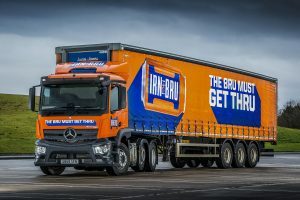 World famous soft drinks leader AG Barr has made a major investment in “commissioning nine new Actros 2543 tractor units from Mercedes dealer Western Commercial. The Cumbernauld-based company’s latest order reflects its commitment to safety, and desire to minimise maintenance costs, while also ensuring it is well placed given the proposed introduction of low-emission zones in Edinburgh and Glasgow. The new trucks are all Actros 2543 models with ClassicSpace cabs and 10.7-litre straight-six engines producing 428hp. Each is equipped with a Safety Pack incorporating the ground-breaking Active Brake Assist 4 system, which features a ‘first’ in the shape of pedestrian recognition, as well as Proximity Control Assist and a driver’s airbag. They wear the livery of AG Barr’s best-known brand IRN-BRU, the carbonated icon which isoften described as “Scotland’s other national drink”. AG Barr runs 47 trucks, 94% of which are Mercs. Rigid 26-tonners form the backbone of the fleet, the new Actros being its only tractors. He continued: “Our policy previously has been to acquire pre-owned vehicles. But we have chosen new trucks on this occasion to ensure that we benefit from their state-of-the-art safety specification. The hugely impressive Active Brake Assist technology in particular, will make a major contribution to the protection not only of our drivers, but also of other road users. Mr Campbell added: “With low-emission zones on the horizon for Scotland we were keen to future proof the business by moving to Euro 6 engines, and to de-risk our maintenance cost exposure by purchasing new, rather than pre-owned vehicles.”.